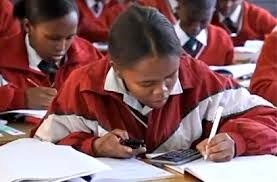 Can your Grade 10 - 12 Maths students afford to be without this service? This is a great, FREE site for students to use after hours either in groups or individually to revise their Maths content and get help with any queries. Microsoft Math provided extra motivation not too long ago in the form of a competition with great prizes. What are the advantages of the Microsoft Math programme? One of the great advantages of this program is that learners can set up their own study groups with friends and see how they are doing or compete with each other! The program is accessible from smartphones, tablets as well as a PC. Get access to quality learning content 24/7, on any device! If you are a Grade 10-12 Maths teacher and your students haven't yet signed up - encourage them to do so without delay. The Learning Gains Through Play project's ultimate outcome is that "learners are equipped with foundational skills and attitudes for future academic success". The targeted skills are visual literacy skills including emotional literacy, English oral communication skills, numeracy skills, gross-motor skills and fine-motor skills. The attitudes of motivation to learn, enjoyment of learning and confidence in learning are also sought but the focus throughout is on the use of play. The purpose of sharing this learning brief is to outline the difference between the gamification design elements of the project as opposed to the focus of the project on learning through play and to explain how the two concepts have complemented each other in this Learning Gains through Play project which has equipped ten primary schools with the Xbox Kinect and 20 android tablets. This brief is intended to provide some insight into a renewed enthusiasm displayed by teachers as well as the way in which some teachers are starting to adapt their teaching strategies. What's happening at the Teacher Centres around the country? In August 2015, 131 delegates from teacher centres around South Africa attended the Teacher Centre Managers workshop in Johannesburg with an intention of "Building Functional Teacher Centres and Competent Centre Managers to Support Quality Learning and Teaching”. Over the past three months, SchoolNet SA staff have visited twenty seven Teacher Centres across all nine provinces to see if the centre managers were putting into action what they had learnt and to see first-hand what both their challenges and successes have been. It has been heart-warming to see what some centre managers have achieved despite having little in the way of resources. Accolades also go to the Vodacom Foundation whose generous donation of IT equipment for a number of teacher centres has had a huge impact on the training and facilities that can be offered to teachers and community members in some communities. Whilst it would have been very difficult to visit every teacher centre, those that were visited have given us a good sense of what is happening generally in teacher centres across the country; what is working well; and what still needs to be improved upon. Johannesburg, 4 May 2015 – Four educators from South Africa joined 300 Microsoft Innovative Educator (MIE) Experts and Student Ambassadors from around the world at Microsoft’s E2 Global Educator Exchange event. The event took place from April 29 to May 1 in Redmond, Washington (USA) at Microsoft’s headquarter. The educators were selected from amongst the most innovative in the world to attend the event, collaborate, create and share experiences with their peers on how to integrate technology and education in ways that improve learning outcomes and equip students for the world of work. Awarded Microsoft Innovative Educator Expert status in 2014, educators Mabore Lekalakala, Linda Foulkes, Warren Sparrow and Mokhudu Machaba were selected because of their ability to employ technology effectively within the classroom in order to help students develop all-important 21st century skills. These educators demonstrated excellence in creating and leading transformational learning environments. Mabore Lekalakala’s learning area of expertise is Computer Adventures; to discover Mathematics where she encourages learners not only to practise created content but to construct their own contextualised games, songs, flashcards, PowerPoint presentations, while learning and reinforcing concepts in mathematics and other subjects. Warren Sparrow’s area of expertise titled ‘HIV Busters’ empowers students to gain a better understanding of the moral and community implications of HIV and AIDS, while substantially advancing their understanding of multimedia and video production. Using their own mobile technology the students created movies about various topics about HIV and Aids that is uploaded to a website that allows other schools to use this as a resource for teaching and learning. As part of the event, MIE Experts will participate in the Global Educator challenge, where they will be divided into groups with peers from different parts of the world to design a project around the use of Microsoft technologies within the specific theme of Bravery, Courage, and Leadership. The E2 Global Educator Exchange event is part of the Microsoft in Education initiative that offers a range of professional development programs to bridge the gap between technology skills and innovative teaching. These programs reach beyond traditional software training to provide a scaffold that supports educators and school leaders of all skill levels on their learning journey. Through these programs, Microsoft trained more than 10 million educators and reached more than 200 million students since 2003 worldwide. We will be holding a short, free SchoolNet webinar on Thursday 28th May at 3:15 . Our speaker will be Alan Goldberg from Digicape who will share on using the acclaimed free iPad app 'Adobe Slate' for creating stunning visual documents. We invite you join us at the webinar. Summary: This webinar will explore the capabilities and potentials of using Adobe Slate on an iPad to create stunning visual stories. You select your style - and your fonts, colour and magazine style design are automatically incorporated. Add your text and images to tell a unique and exquisite story - then share your story anywhere on any device. GEG Meetup at Rondebosch High – plenty of sharing of ideas..
On Friday 24th April I excitedly made my way to Rondebosch Boys High to take part in a GEG (Google Educator Group) Meetup. Google’s world-wide GEG initiative aims to grow voluntary groups of teachers in communities who will share their use of the various Google offerings with other interested teachers in their community. Here in South Africa our Google Educator Groups are growing steadily with a membership of 679 teachers since August 2014. To date we have 12 GEG groups around the country. The GEG South Africa Google+ community https://goo.gl/2fDXtN keeps a record of all the various groups and their activities. We invite you to join the community. But back to the afternoon of Friday 24th April. This was the first Cape Town Central GEG group meetup since the group was formed in August last year. There were around 20 - 25 attendees and the programme was even better than the one advertised because it turned out to be a type of informal Demoslam (Google’s terminology for a TeachMeet where teachers voluntarily share ideas in short presentations with the rest of the group). Chrome books were placed on the tables for us to share and explore. Glen Jones, the Cape Town Central GEG leader who teaches at Western Province Preparatory School opened the meeting and shared about how their school is using Google Classroom. WPPs is using Chromebooks for some of their classes so Glenn showed us the workings of a Chromebook. He also showed how they are making use of Google Classroom in a team manner with a class. One class can be shared between a number of teachers. There were a number of queries and ideas from the attending teachers about using Google Classroom as a group of teachers. Andrew Hughes a Maths teacher from WPPS shared on how he uses Google Forms for Maths. There was discussion on how to use Flubaroo to mark Maths tests. Rhine Adams who is new to WPPS is the Grade 2-7 art teacher and he shared how he uses Google products in Art. He also keeps his classes together using Google Classroom so that he can share interesting resources with the classes. The students can also share resources via Google Classroom. The students work from Google Drive with Apps that can edit images such as Pixlr editor. He demonstrated how to do this. He also uses Google Sites with the Grade 7s and often visits the Google Cultural Institute virtually with the students. Leighton Forbes briefly showed us a site called http:// beterafrikaans.co.za which is great for Afrikaans teachers. What I enjoyed about this Meetup was the way folk could ask their questions and different teachers would attempt to answer them, demonstrate or add their viewpoints. After the meeting we all networked and shared informally as we tucked into the beverages supplied and eats that were supplied. The two GEG leaders for the Cape Town Central Community, Glenn Jones and Leighton Forbes, are considering holding these meetups on a regular basis incorporating the Demoslam method of sharing ideas, tips and tricks being used each time. We would like to remind you about Microsoft and SchoolNet's exciting competition for teachers who are using one or more of the Microsoft tools mentioned below as part of their teaching. The closing date has been extended to 1 June 2015! 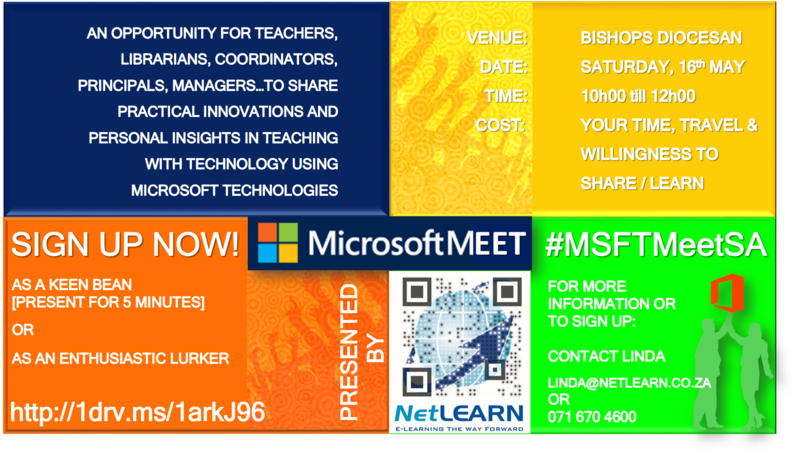 You could win a trip to the SchoolNet SA ICT in the Classroom conference in Durban in July or a Teaching with Technology Kick-Off session for your school by sharing your idea for using one or more of these Microsoft tools with other teachers and creating a Facebook post about it. More details about prizes are given in the Prize section below. Use one or more of the following new free tools from Microsoft in a lesson. If you have not used any of these tools before, use this as an opportunity to try one or more of them out. - VERY IMPORTANT Create a post on your own Facebook page. Save it as PUBLIC and add the hashtag to your Facebook post #MSToolsInEdu15 - this will enable us to find your entry. Once you have done that if you have any queries you can inbox the Microsoft-South Africa and Lesotho page and let us know. - In your post describe how you have used a Microsoft tool to create a great lesson. Tell us what impact the tool has had or how it has enhanced your teaching. Your post should not be longer than 2 sentences. - Please include 1 to 3 photos in your post. These could be screen grabs of the tool in action or a photo of the lesson in progress. Remember to get permission from learner’s parents to include photos of them if you show their faces or take photos in such a way so that learner’s identities are protected. - Alternately create and share a short video (no longer that two minutes) describing how you have used the tool. You can create a video that shows off your creation as a screencast – or it can just be a simple video shot with your cell phone in which you explain what you did. We would love people to see your great lesson idea. Ask your colleagues, professional network, Twitter followers and Facebook friends to like your lesson idea on the Microsoft in Education – South Africa and Lesotho Facebook page. - This competition is open from 23 April 2015 to 29 May 2015 – so you can put up your post anytime during that time period. - Prizes will be awarded to the most popular lessons as measured by the number of “likes” they receive as well as the lessons which the Microsoft and SchoolNet panel of judges believe to be the most creative and engaging uses of the Microsoft tools. - Microsoft is not responsible for lost, corrupted or delayed entries. No purchase necessary. Entry constitutes full and unconditional acceptance of these Terms and Conditions. Microsoft reserves the right to disqualify anyone in breach of these Terms and Conditions. This contest starts at 08h00 hours GMT on Friday 24 April 2015 and ends at 17h00 hours GMT on Friday 29 May 2015 (inclusive). Personal data which you provide when you enter the draw may be used for future Microsoft marketing activity. The winner will be notified in the form of a direct inbox on Facebook or Twitter. The winner will also be announced on our Facebook and Twitter pages. The winner may be required to participate in further publicity or advertising. The Prize is not transferable. No cash alternatives are available. Microsoft reserves the right to substitute the Prize for another prize of equal or greater value. The Prize will be issued to the winner within 2 weeks of notification. The winner’s consent to their names being made publicly available. Winner’s names may be available on Microsoft’s Facebook page – Microsoft South Africa for a period of 3 months after the final draw date by email. No correspondence will be entered into regarding either this Contest or these Terms and Conditions. In the unlikely event of a dispute, Microsoft’s decision shall be final. Microsoft reserves the right to amend, modify, cancel or withdraw this promotion at any time without notice. Microsoft cannot guarantee the performance of any third party and shall not be liable for any act or default by a third party. Participants in this promotion agree that Microsoft will have no liability whatsoever for any injuries, losses, costs, damage or disappointment of any kind resulting in whole or in part, directly or indirectly from acceptance, misuse or use of a prize, or from participation in this promotion. Nothing in this clause shall limit Microsoft’s liability in respect of death or personal injury arising out of its own negligence or arising out of fraud. This Contest is sponsored by Microsoft South Africa (Pty) Limited, 3012 William Nicol Drive, Bryanston, 3091. The Contest will be facilitated by SchoolNet SA. This contest is open to any educator in South Africa or Lesotho that uses a Microsoft tool in a lesson and shares the idea through the delegated Facebook Page. This contest excludes Microsoft employees, their agents and their families, and anyone else professionally connected with this contest. ‘Take education to new heights using Microsoft Sway’ by Kathryn Riva, a Microsoft MIEExpert from SA. During the Grade 5 Blended Learning Week at Micklefield the girls were given the task of exploring countries and cities in our African continent. This task was carried out using researching skills and presenting the findings as a Microsoft Sway presentation. In each section, different instructions had to be followed i.e. finding facts, adding relevant videos, including appropriate pictures and creating a link to an article to back up ones findings. These are three examples of the final product by Miyo, Emma-Beth and Hannah. Kathryn kindly shared the task she set the girls. Thank you so much for this lovely post Kathryn. “We are looking for teachers to help us test a new, Google online course. It only requires 30-60 minutes of your time, and we'll do it over Hangouts. We are especially looking for non-computer science and non-ICT teachers. Give us some of your time and feedback on a set of the resources we are developing... You’ll find a form that looks like the image below at this link: Computational Thinking MOOC – Testers "
Join the GEG South Africa community! This extension claims to ‘automatically suspend unused tabs to free up system resources’. When I click on it I get two options. Actually, I am starting to love this extension after using it for a few hours. It really does its job well! Become a creator of technology. Break into code! Get excited about coding with a new contest from Microsoft Imagine. Break into code! Learn to code! Create a game! Win cash prizes. Microsoft Imagine introduces the Break Into Code challenge as a beginner level challenge that will get your students excited about coding even if you or they don’t have any previous experience. Microsoft Research’s TouchDevelop gets students of all ages started with a simple, easy to follow tutorial on coding a brick breaker game. The tutorial will get you started from a blank slate to a working game which you can then personalize and reinvent to make it your own. You can use any device with a browser and internet connection to participate. Africa Code Week: you and your students can take part in the pilot event at the Science Centre in Cape Town June 1 to June 4. A joint initiative by SAP, Simplon, Galway Education Center and Cape Town Science Centre, Africa Code Week is a one-of-kind educational initiative taking place in October 2015 across 11 countries. Sparking interest in creative computing through hands-on game design learning, Africa Code Week seeks to empower African youth with the coding skills they need to thrive in their career and become key actors of Africa‘s economic development. In 2015, we plan to host coding workshops for 20,000 kids and youth from 3 different age groups (8-11, 12-17 and 18-24) in South Africa, Angola, Cameroon, Kenya, Ivory Coast, Nigeria, Senegal, Morocco, Tunisia, Togo and Egypt. We are calling on governments, NGO’s, corporations, CSR departments and educational institutions to work together with us to deliver training workshops for teachers and actual coding workshops for children and students. Africa Code Week will officially be launched during the World Economic Forum on Africa (Cape Town, 3–5 June) and a pilot event will take place at the Cape Town Science Centre from June 1 to June 4. Entirely free of charge, this pilot allows teachers interested in hosting coding workshops to be fully trained and children aged 8-11 to be among the first to engage in this continent-wide, historical initiative! 30-31 May 2015: FREE Train the Trainer workshops for anyone with coding ability who would like to train others in order to organise and host events during Africa Code Week. 1-4 June 2015: FREE Coding (computer programming) workshops for 8 to 11 year-olds. EdTechTeam iOS and Google Summit South African Tour…This will be good! Reduced pricing! We are pleased to announce the first EdTechTeam iOS in Education Summit (8 October 2015) and the EdTechTeam Google in Education Tour Cape Town Summit (9, 10 October) to be held at Parklands College in Cape Town. These high intensity one and two day events focus on deploying, integrating, and using Google Apps for Education, iOS and other digital learning tools to promote student learning in K-12 and higher education. The program features Google Certified Teachers, Google Apps for Education Certified Trainers, Apple Distinguished Educators, practicing administrators, solution providers, and representatives from the Google education teams. Register now to send teachers, administrators, tech directors, library media specialists, tech support staff, CTOs, and anyone who is interested in finding out more about leveraging Google Apps for Education and iOS to support student learning. Local organisers, SchoolNet South Africa and Parklands College, negotiated a special rate with the conference organisers. Early Bird Google in Education Tour registrants pay only US$225 as long as they register before 9 August 2015. The cost of the one day iOS Summit is $175.00. The cost of a one day Pre-Summit Workshop is $175.00. Please see the attached flier or visit http://za.gafesummit.com/ for more information. We would appreciate it if you forwarded this message to your education contacts. This is a message from Michelle Lissoos from Think Ahead about a International speaker they are bringing to South Africa. Join our international speaker, Paul Hamilton as he takes you through a visual journey of how creative teachers use mobile technologies over traditional technological tools, to create relevant and collaborative learning spaces. Paul Hamilton is the ‘Head of Learning Technologies’ at Matthew Flinders Anglican College, Australia, renowned for his work in the effective use of the iPad, Augmented Reality and iBeacon technology. Paul is a best selling Published Author, Award Winner, Apple Distinguished Editor, App Developer and sought after Keynote Speaker. The creators of Estimote, one of the fastest growing technology companies in the world, have labelled Paul an “Edtech Pioneer”. “We're very excited to announce that the Inspired Teachers Conference, powered by QualityLife Company, is bringing internationally recognised Dr Christopher Emdin - a science advocate who uses hip-hop to make better teachers - to South Africa this year. "Dr. Christopher Emdin, Associate Professor in the Department of Mathematics, Science and Technology at Teachers College, Columbia University will give the keynote address at the 5th Annual Inspired Teachers Conference on August 18, 2015 in Johannesburg. "For more information on Dr Chris Emdin, go here. You’ll also find his TED talk here, but if you really want to learn what teachers must know to create magic, (and what rap shows, barbershop banter and Sunday church services have in common) you have to sign up here here! "Another plus is that we are now able to extend the deadline for speaking submissions. Bear in mind that this conference has been created specially to celebrate the commitment of the remarkable teachers who are shaping young leaders on a daily basis, often in difficult circumstances. InspiredTeachers recognizes and learns from the teachers who know how to light up a classroom; shares leadership lessons and inspiration with our teaching community and focuses on celebrating excellence in teaching. To submit your proposal please send it to me here: Dunne, deadline date for submissions is 22 May. (video and/or audio clips are always an advantage to give us an idea of your speaking style). The Microsoft E2 Global Educator Exchange took place in Redmond, Washington earlier this month. Angela Schaerer from Microsoft has provided us with all these links to this great event. Google’s recent free online conference on May 8th and 9th was a HUGE two-day event with amazing speakers. What a great way to share information with the world of educators. All the recordings were uploaded by the next day! The 2015 Education on Air conference featured tens of thousands of registered educators from 185 countries. They had more than 100 sessions to choose from in the two-day event. The recordings can be found neatly organised at the following link: https://educationonair.withgoogle.com/live/2015-may. Matt Miller from Ditch that Textbook was equally fast in uploading his review of the event via his blogpost ‘10 key takeaways from Google’s Education on Air conference’. He reports that the videos can also be found at this link on YouTube. Thank you Google for this educational feast! On Thursday afternoon 7th May 2015 at 3:15pm we held a webinar presented by four of Microsoft’s South African MIEExpert teachers. & Mokhudu Machaba educator from Ngwanamago Primary in Polokwane. SchoolNet South Africa provides a short, free webinar on most Thursday afternoons during the school term. You might have attended the Microsoft Roadshow this year or missed it completely – no worries, here is the opportunity you have been waiting for! It is time to collaborate together at the first MICROSOFTMEET held by NetLEARN Update. You will be inspired by all the free technologies Microsoft has to offer the educator. In addition, if you are wanting a relevant, current and rewarding professional development route for your teachers, which has badge incentives and tracking, then this session is not to be missed. Our four South African #MIEExpert teachers were highlighted in the May 6th Star Workpolace in Johanneburg. They have recently returned from the amazing, week-long Microsoft E2 Global Educator Exchange in Redmond, Washington along with innovative teachers from all over the world. On 18-19 May South Africa’s No.1 student event, SABC Education Career Indaba, will take over Sandton Convention Centre. With over 3500 visitors already registered to attend, we are taking this year’s Career Indaba to the next level. View some of ouradditional event features below. In this dedicated time, parents will have the opportunity to have one-on-one conversations with top employers and education institutions about the right career and study path for their child. Parents will also have access to a workshop held by our guest speaker: Claire Marketos, founder of Inspired Parenting. The Parent Networking Evening will take place from 17:00-19:00 on 18 May. The aim of these free-to-attend workshops is to give students practical knowledge on how to succeed after school by providing them with interactive sessions that will give them real advice, from real people! The workshops will take place on both days of Career Indaba; we have attached the programme for you to share with your students. A Career Indaba team member will take students on a guided tour tailor-made for school students who are not sure where or what to study. Students will embark on a journey giving them the full experience of the exhibition floor and guaranteed to help them find their potential. The VIP tour will take place at 11:30 on 18 May and will start at the workshop entrance. 1. Get an answer sheet from the organiser’s office. 2. Visit the relevant stands to find the answers. 3. Drop the completed answer sheet in the answer box at the organiser’s office. 4. Be present at the prize-giving to stand a chance to win big. The prize-giving will take place at 16:00 on 18 May and will take place on the exhibition floor. Click here to view what Gareth Cliff has to say about Career Indaba.